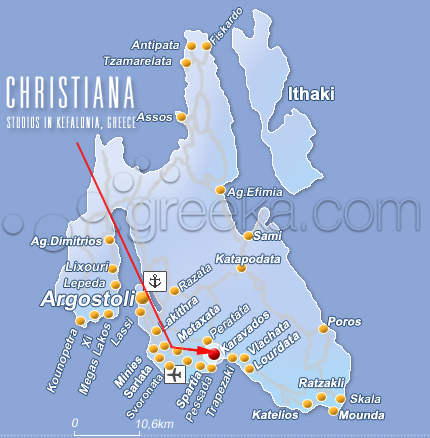 In the southern Kefalonia in Libatho in our beautiful ever green island and the village Karavado which is 8km far from the capital of the Argostoli, you will find to rent our newly-built "Christiana Studios". The well-decorated rooms are situated near the busiest but also quietest crystal-clear beaches. Look at our pricelist, we have offers during all summer. Our Studios and lots built in a distance of six (6) acres are fully equipped with a cooker, safe box, refrigerator, hair dryer, air-conditioning, TV, heating, a spacious bathroom with a shower and comfortable verandas with a view of the sea and Enos which its unique black fir trees and beautiful wild ''ponies'' constitutes the wild fauna and flora of our island. Karavados has its own beach Saint Thomas which is roughly 1.5 km far from our newly built rooms, while in a distance 5 km you will find the wonderful beaches of Abythos, Ammes, Ai Helis, Wide Seashore and long Seashore many of which have been honoured with the light blue flag of the European Union. The island with the rich tradition in the music, theatre, dance, architecture and letters is the largest of Ionian islands with 254 km coastline, marvellous sandy beaches with deep blue turquoise water and the highest mountain Enos, 1628meters high, which is world known for its unique Kefalonian black fir trees. Wonderful excursions to Mellissani subterranean lake, Drogarati cave known for its stalactites, Katavothres, Monasteries of Saint Gerasimos and Saint Andreas, the castle of Saint George, Saint Efimia, the fishing village of Assos and the traditional one of Fiscardo, to name a few. Regular Air-Sea-Bus connections with Athens, Patras, Kyllini, Zakynthos, Ithaca (ancient kingdom of Odysseus), Lefkada, Astakos and Corfuand ferry boat connection with Italy. International charter flights from April to October from many European cities. The beach of Myrtos is one of the most popular and beautiful beaches of the island, it is famous for its beauty and from there, one can enjoy one of the most wonderful sunsets of the island.